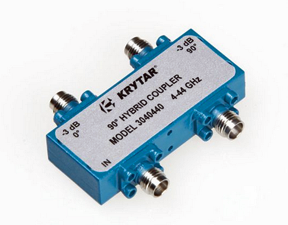 KRYTAR, Inc. has released a new 90 degree hybrid coupler that delivers 3 dB of coupling over the ultra-broadband frequency range of 4.0 to 44.0 GHz in a compact package. KRYTAR’s hybrid couplers are designed to perform many functions, including splitting and combining signals in amplifiers, switching circuits, and antenna beam-forming networks used in a wide range of commercial and military applications. KRYTAR’s new hybrid coupler, Model 3040440, delivers exceptional ultra-broadband versatility from 4.0 to 44.0 GHz with excellent phase and amplitude matching. Typical specifications include 3 dB Coupling; Amplitude Imbalance: ±1.2 dB; Phase Imbalance is ±12 degrees; Isolation is >13 dB (4-30 GHz) and >8 dB (30-44 GHz); Maximum VSWR: 1.65 (4-30 GHz) and 1.90 (30-44 GHz); and Insertion Loss of <3.2 dB. This new hybrid coupler lends itself to emerging mm-Wave and 5G wireless broadband designs and many test and measurement applications. The new coupler can be also be manufactured to meet military specifications. In addition, Model 3040440 offers Input Power Rating of 20 W average and 3 kW peak. The hybrid coupler comes with industry-standard 2.4-mm Female Connectors. This compact package measures just 1.99 inches (L) x 0.80 inches (W) x 0.42 inches (H), and weighs only 1.5 ounces. Operating temperature is -54° to +85° C. This coupler is typically available from stock to 30 days, ARO.